This weekend I decided to get some new clothing. I live in the country and if I'm not shopping online, I really don't shop. So thought to try out "Stitch Fix"; a service that sends you outfits and you keep only what you like. Anyways, in Stitch Fix, I was prompted to create a "style profile" and there is one section for career. I thought it was just something my clients and I talked about, but there you have it. Even Stitch Fix sees health pros as "technicians." Listen,"technician" is not how you want to position your coaching business or private practice. Nearly all of my clients, at first, are in the "technician" category before we refocus them into a qualified expert with a speciality coaching business. Now by a speciality business, I don't mean repositioning clients to only work with an exclusive clientele, offer exclusive pricing or lead with perfect hair and make up marketing. You certainly don't need to be the most "expensive" option to move out of "technician" positioning. A technician offers hourly sessions. An expert offers an experience that will solve a specific problem. A technician charges by the hour. An expert charges for a complete start-to-finish solution and is paid-in-full, or by convenient payment plan. A technician's income is limited by the hours in her day and the whims of her client base. An expert's income is based on a mutually agreed upon, client engagement and is not impacted by human whims and "life stuff" like cancellations, rescheduling or disappearing acts. A technician emphasizes her certifications and trainings as the main selling point. The expert emphasizes the relationship with her clients and the problem her ideal clients are determined to solve, and backs it up with her expertise. A technician takes all kinds of clients. An expert makes bold choices in who she works best with, so that she can feel confident about delivering a high quality experience. A technician talks about her process. An expert talks about the before and after picture of her client's transformation. A technician works for others: her clients, an organization, etc. An expert controls the terms of her work, be it in-house (as a consultant), or for an individual (as a coach/counselor/advisor/specialist). A technician is often a generalist. An expert specializes in one message, one audience and one offer and gives up the trying to be all things to all people. A technician reacts to what comes her way. An expert choses her response to the marketplace and leads her practice and her clients. We have ALL been trained to be a good technician. To "hold the space" and see what the client wants and needs. But that doesn't work in the real world, unless you're working for someone else. Your clients, the economy and your sanity in business is calling for your leadership. Not perfect leadership, but "perfect as you go" leadership. Aiming for perfect keeps you in your head. As Tony Robbins once said: Stay in your head, you're dead. Perfecting as you go has you taking action, trying things, seeing what works, what doesn't and adjusting. Want help with this? I have one more spot for April and I'm ready to help you restructure your practice and streamline your marketing in the #happylittlepractice, #smallisthenewbig way. Here's where you can apply to talk with me about your business. Daily Inspiration and Tips - Are you reading my posts on 30 days of spring cleaning your business routines, #happylittlepractice style? You can follow and comment on Instagram or Facebook here. Let's elevate your routines and results in professional coaching. When you're just getting started in coaching or consulting, it's all about figuring out WHAT routines to implement in your work day. When you're doing well in your coaching business, it's all about ELEVATING your routines to reignite your fire and prevent burn out. I've got you covered on both fronts! But I'll admit, "routines" do have a bad rap. In my opinion, it's because we do them in an overly masculine way that leaves us feeling tight, cranky and anxious. And that's like putting yourself on a task diet. No thanks! Introducing a more balanced, feminine way that helps you GET IT DONE and leaves you feeling like a WOMAN at the end of the day. Join me for this free virtual class series about your coaching business routines and how I use therapeutic quality essential oils to bring it all home and make them stick. All class times are for Fridays, at Noon Eastern. This is all about how I "open the shop", "run the shop" and "close the shop" on a typical work day, doing my marketing and coaching clients from my home office, as a "company of one." From what to do before you start your day, how I create new business in about 1 hour a day of marketing, how to reset your focus when you lose it, how to transition to mom life (I stop working at 3pm) and finally shift into spouse/personal time. I'll cover 5, super simple routines and how I use the essential oils to make them feel pleasurable, focused and yet very effective. What I'll share with you in this class has quite literally saved my business more than once. I have two routines that take about 15 minutes to ensure you don't get stuck in your head about your marketing, your focus and the next right actions for you and your business. Bring a journal and paper to this one too! Sleep is a KEYSTONE habit, especially for moms in coaching. If this one falls apart, I bet your brain gets foggy and everything in business starts to feel HARD. That said, it's not so easy to "turn off" the buzzing in your brain at night when you create for a living. Especially if you're daring to do something new! So I'll share my "power down" routine and essential oil practice to sleep deeply and train my brain to calm down. This is like bio-hacking your business. Yes, I know, I'm going there. There is a way to manage your time to work WITH the energy currents you have going on and not against it. I SWEAR just doing this super simple routine during PMS and during my moon time, along with just ONE essential oil blend, helped to eliminate perimenopause symptoms, reduce mood swings and doubled my energy without doing much else. Seriously. I didn't change my diet or my exercise (which was nil at the time) and just this alone started to turn things around. Now of course, I can't promise this will happen to you too. I'll give you the routines and frameworks, you'll have to apply them. And I'll be referencing and can only vouch for doTERRA essential oils and their proven efficacy but please feel free to use whatever brand of oils you like. I'll be sharing what specific oils I use with each class and it's respective routine. And I promise, everything I will share will be simple and makes a big difference if you have to rely on yourself to get it done, day in and day out. Whether you're an experienced coach and ready to level up your business, or you're a new coach or getting back into coaching after a break; or you just ready to spring clean your daily routines to help pull yourself forward, and increase the peace and profit in your personal economy, I've got you covered. Join this event series and I'll keep you posted for the private Facebook Lives and option to call-in via a convenient tele-conference line, if you prefer listening on-the-go. Links to replays will be posted in the discussion tab of the Facebook event. A quick tip on creating peace and plenty in business, the #happylittlepractice way. 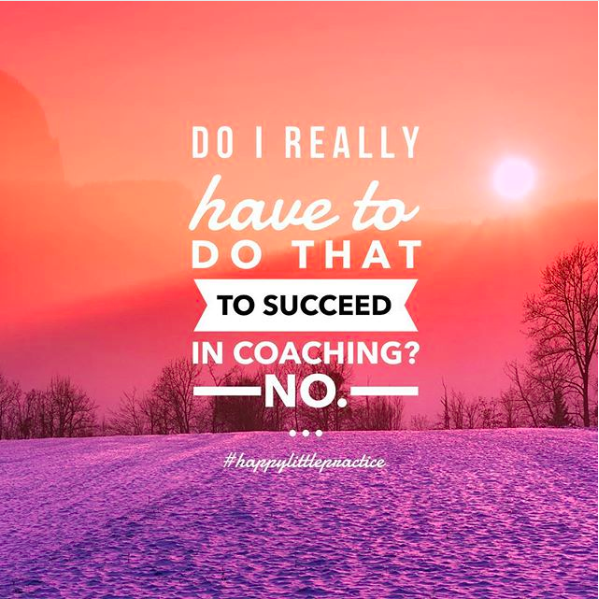 For you coaches...Here's something to remind you, while you navigate the pressures of every day, that you don't need to be everywhere, do everything or even do what everyone else is trying to do to thrive as a coach, consultant or holistic practitioner. Just like any relationship, how you handle the hard times can make or break the relationship. Your business is a kind of relationship. It's easy to love it when it's happy-go-lucky time. It's also easy to feel deflated and lose your nerve when it's not acting in the way your imagined it would. Think of a challenging situation in your business. Ask yourself, "what would love do?" I always find relief and a clear next step when I ask that question. P.S. - Want help restructuring your practice into a small, but mighty little business? Click here to watch my signature webinar on why I created the #happylittlepractice method for myself and other parents who don't necessarily want to build an empire, but for sure need to earn well. P.P.S. - If you're ready for a marketing mentor who gets the part time hours, full time income thing, get in touch here. Happy is a valid business strategy. When you really take stock and recognize what makes you happy, it makes business decisions much easier. It gives you patience, and respect for timing and the time you have. It helps you focus on winning at the only thing you can, your own dang life. It helps you take on the right clients. It helps you say yes, and no. (And quiet the comparing yourself to what colleagues are doing. What makes me happy in biz may be different from you. Find out what truly makes you feel peaceful and plentiful and then let that inform every inch of your biz, and life.